Home>News of Medical Accessories > What are disposable gloves made from ? What are disposable gloves made from ? Medical gloves are disposable gloves used during medical examinations and procedures that help prevent cross-contamination between caregivers and patients. Medical gloves are made of different polymers including latex, nitrile rubber, vinyl and neoprene; they come unpowered or powdered with cornstarch to lubricate the gloves, making them easier to put on the hands. Cornstarch replaced tissue-irritating Lycopodium powder and talc, but even cornstarch can impede healing if it gets into tissues (as during surgery). As such, unpowered gloves are used more often during surgery and other sensitive procedures. Special manufacturing processes are used to compensate for the lack of powder. There are two main types of medical gloves: examination and surgical. Surgical gloves have more precise sizing with a better precision and sensitivity and are made to a higher standard. 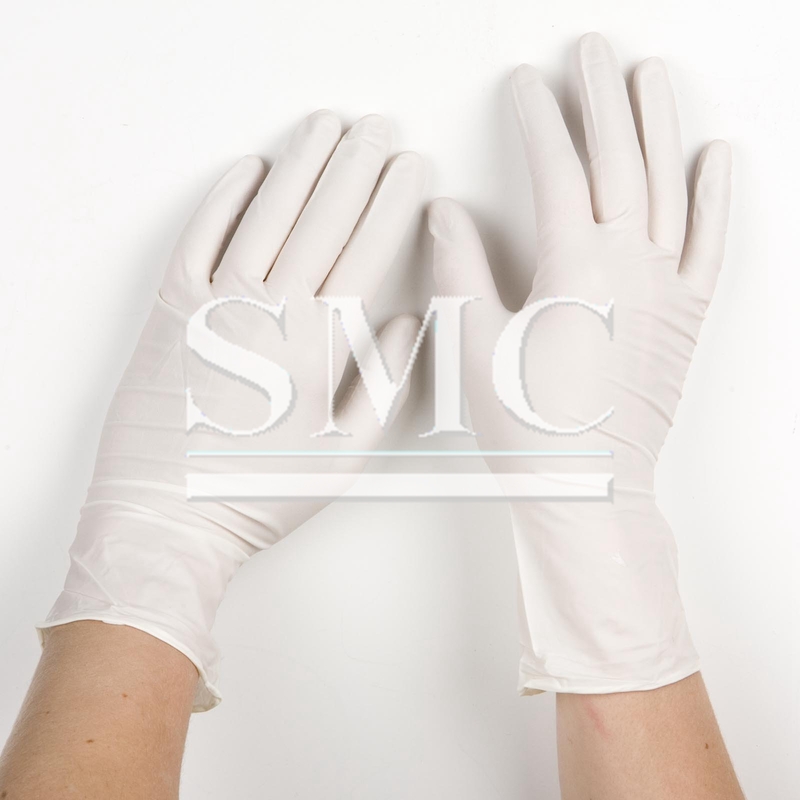 Examination gloves are available as either sterile or non-sterile, while surgical gloves are generally sterile. Natural rubber latex surgical gloves were first used in 1890. Their usage increased dramatically in the late 1980s, when latex gloves were widely recommended to prevent transmission of blood-borne infections, such as the human immunodeficiency virus (HIV). The incidence of allergic reactions to latex began to rise rapidly among patients and health care workers in the 1990s. Since then, new synthetic glove materials have been introduced, which have differing properties with regards to strength, comfort and sensitivity. However, the majority of surgical gloves are still made from latex. 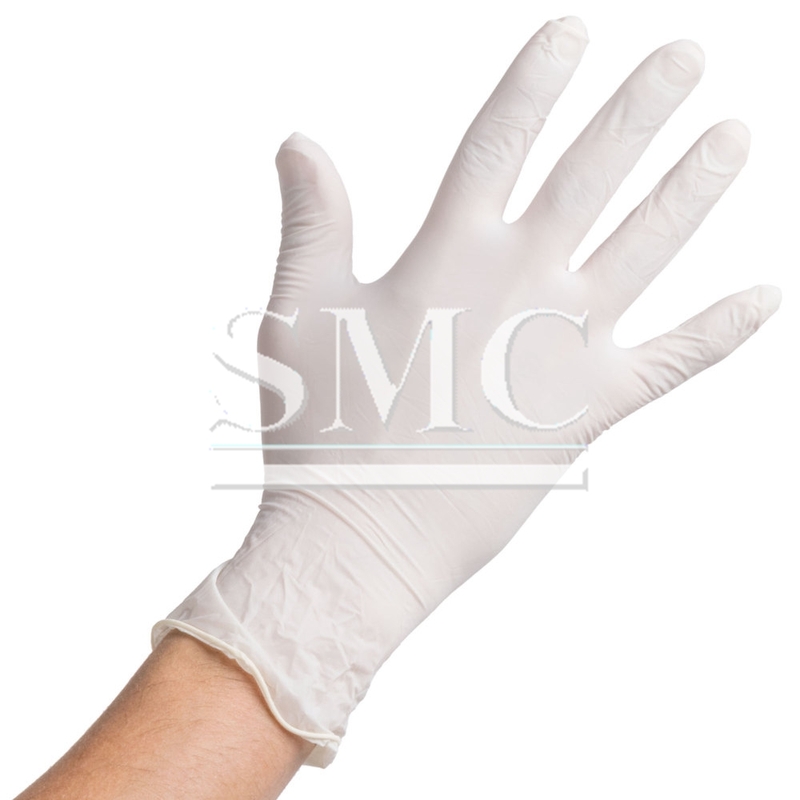 Medical examination gloves are often made of latex or synthetic materials such as nitrile or vinyl (PVC). Vinyl gloves are less durable and provide weaker chemical protection than other glove materials, so they are not suitable for healthcare workers in direct contact with bodily excretions or those who handle chemotherapy drugs. Caroline Hampton became the chief nurse of the operating room when Johns Hopkins Hospital opened in 1889. When "(i)n the winter of 1889 or 1890" she developed a skin reaction to mercuric chloride that was used for asepsis, William Halsted, soon-to-be her husband, asked the Goodyear Rubber Company to produce thin rubber gloves for her protection. In 1894 Halsted implemented the use of sterilized medical gloves at Johns Hopkins.The first disposable latex medical gloves were manufactured in 1964 by Ansell. They based the production on the technique for making condoms. These gloves have a range of clinical uses ranging from dealing with human excrement to dental applications.Criminals have also been known to wear these gloves during the commission of their crimes. These gloves are often chosen because their thinness and tight fit allow for dexterity. However because of the thinness of these gloves, fingerprints may actually pass through the material as glove prints, thus transferring the wearer's prints onto the surface touched or handled. Due to the increasing rate of latex allergy among health professionals, and in the general population, gloves made of non-latex materials such as vinyl, nitrile rubber, or neoprene have become widely used. Chemical processes may be employed to reduce the amount of antigenic protein in Hevea latex, resulting in alternative natural-rubber-based materials such Vytex Natural Rubber Latex. However, non-latex gloves have not yet replaced latex gloves in surgical procedures, as gloves made of alternative materials generally do not fully match the fine control or greater sensitivity to touch available with latex surgical gloves. (High-grade isoprene gloves are the only exception to this rule, as they have the same chemical structure as natural latex rubber. However, fully artificial polyisoprene—rather than "hypoallergenic" cleaned natural latex rubber —is also the most expensive natural latex substitute available. Other high-grade non-latex gloves, such as nitrile gloves, can cost over twice the price of their latex counterparts, a fact that has often prevented switching to these alternative materials in cost-sensitive environments, such as many hospitals. Nitrile is a synthetic rubber. It has no latex protein content and is more resistant to tearing. Also it is very resistant to many chemicals and is very safe for people who are allergic to latex protein.Nitrile gloves are the most durable type of disposable gloves. Although nitrile gloves are known for their durability, extra care should be taken while handling silver and other highly reactive metals because those substances can react with sulfur, an accelerant in nitrile gloves.